Social Media Marketing (SMM) is a form of online marketing that uses social media as the main marketing tool and communication channel. The aim of SMM is to produce great content that users will share on their social networks to help a company increase brand awareness and broaden its visibility. Social Media Marketing (SMM) is thus the process of advertising on Social Medias. All the major Social Networks are allowing brands, agencies and marketers to advertise their products or services via a dedicated platform under different business models such as CPC (Cost Per Click), CPM (Cost Per Mil) or CPE (Cost Per Engagement). Social Media are online communication tools that allow people to connect with each other by creating, publishing and engaging with content. All this interactions happens in Social Networks such as Facebook, Twitter, Instagram, Pinterest, Google+, Youtube , Snapshat and much more. In 2016, globally, the Social Networks are accumulating around 2,5 billions active users! Nowadays besides the huge number of Social Networks users and their amazing KPI (ARPU - Average Revenue Per User), the users' retention rates, the daily time they spend on Social Media platforms that is increasing, you do not want to miss that opportunity to engage with your target audience. The results of Social Media Marketing are calculated based on the number of users' interactions (re-tweets, shares, comments, likes and views) of the contents created. Social Media Advertising push user-generated content from within the most popular social media platforms such as Facebook, Google+, Twitter, Instagram, Pinterest, Snapchat and LinkedIn. 21 minutes is the average time per day that a unique user spend on Facebook. 40 billion of photos were shared on Instagram in 2015. 24% of Twitter accounts belongs to journalists and influencers. 4 billion of video are viewed in Youtube every day. 60% of Snapchat daily users are contributing in creating content. Generating leads and potential customers. Raising your website traffic through Social Media. Growing our online visibility and popularity. 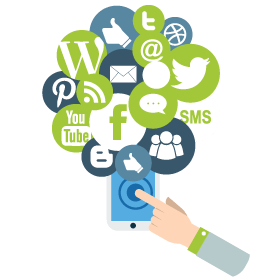 SMM helps your firm to get direct feedback from users and customers while making the company seem more personable and interactive. The "sharing and interaction" parts of social media give to your followers the opportunity to ask questions or voice complaints and feel they are being heard and considered. Thus, thru Social Networks and Social communication with your users, your are also managing a very key aspect of your business: the Customer Relationship Management or CRM (in this case Social CRM). How can we help you manage your Social Media Marketing Plan? We can help you to define your Social Media Plan by analyzing your Social Media metrics and KPIs in order to improve and track your brand reputation and reach your strategic goals. We plan, create and implement customized content strategy and editorial calendar for your Social Media accounts following your brand image, values and culture. The main social networks (Facebook, Twitter, Instagram or Snapchat) contents can greatly increase your website traffic in the long term. Our experts can help you define the most relevant platform, type of content and additional social integrations for your brand. Our social media professionals can create and manage your profiles or brand pages on your behalf. Let our expert optimize, engage and increase your social followers on multiple networks. Our experienced copywriters will create unique and highly targeted contents (image, video, tweet, texts, articles, etc.) to share on your different social networks Contents are always optimized to have the greatest impact on your targeted audience. Competitions, contests, surveys, interactive games and updates. We support, advise and set up a multitude of targeted marketing actions to engage your fans, retain customers, grow your prospects... Make the "buzz", encourage word of mouth and shares around your brand and offer you the opportunity to exploit new advertising formats. We are here to help you discover the full potential of your social media marketing strategy and reach your business goals together by unleashing the power of Social Media networks! Don't hesitate to get in touch with us to talk about your project and needs.